OK, some people are creeped out by the idea of bats being around, but they're very docile and helpful critters. I make my living by evicting colonies of bats (very gently of course) from houses in suburban areas. For years I have told my customers not to bother buying and installing traditional bat houses in our area because the success rate associated with them is so low in our area. Fact 80-90% of the bat population in suburban areas resides in houses, attics and other man-made structures. In July of 2004 I performed a bat removal service at a home in a small sub-division and evicted a few dozen bats that were entering through the gable vents. If these suburban bats are so determined to roost in gable vents than why not build a bat house that closely resembles one? When installed correctly, the Urban Bat House out-performed the traditional bat house in Suburban areas 10-1. Fact - Traditional bat houses in Massachusetts and Rhode Island have less than a 5% success rate in attracting bats. In many cases I have evicted groups of bats from a gable vents and installed a traditional bat house in close proximity to the secured gable vent (as pictured above) in an effort to get the bats to inhabit the bat house. The idea behind this bat house is rather simple- Install a gable-vent with a roomy, well-ventilated chamber for bats OVER the existing gable-vent that the bats are already using (or will be soon be using when they locate it). You can expect to see bats residing in these types bat houses from late April until mid-October depending on the daytime temperatures. 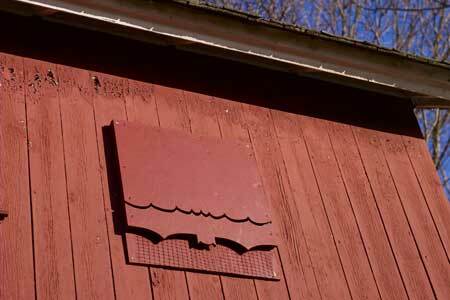 Air-Flow- By installing the bat house over your gable-vent your provide bats with a constant air-flow from the attic. Performance- If bats were using your existing gable-vent to enter your attic or just as an exterior roost you should have close to a 100% success rate for getting bats to use your Suburban Bat House. Almost Invisible- Once installed and painted to match the house the Suburban Bat House is almost invisible. Easy Installation- It takes a little bit of carpentry skills to install the Suburban Bat House correctly but it is much easier than erecting a 20-foot steel mounting pole in the middle of your yard for a traditional bat-house. I would love to build a few hundred of these houses and install one at every bat removal and exclusion project that I perform but I just don't have the time to build them. Building Nest Structures, Feeders, and Photo Blinds for North Dakota Wildlife Johnson Bat House. Educating yourself on bat behavior and biology is almost a must if you plan on putting up a bat house. I got a wild hair today and I built a house for my resident bats that do such a good job of keeping the mosquito population under control. I searched the Internet for some plans and ended up drawing up my own design based on a few of the simpler designs that I found on the Internet. It might be hard to read, but basically it only takes a 12 inch by 12 inch piece of plywood for the back, plus a couple smaller plywood pieces for the front and one more for the roof, plus several thin slats. Now that everything is verified to be the correct size, I’m ready to attach my landing pad. Below you can see the landing pad completely installed from the front side where the bats will land. You can see below that I used wood clamps to hold the wood together tight and then I installed some screws. Then I laid the bat house next to the roof so I could mark where the slats are located so I can put screws through the roof directly into the center of these four slats. Then I hung the back piece as I described earlier using the picture wire to wrap around the pole several times. The Suburban Bat House Plans The Assembly This Very Simple image below is a part of Bat Houses Plans Collection Gallery. Bat Houses Plans – Great home designs will provide a positive ambience for home owners and the people who live in the house. Just for your information, the Bat Houses Plans photos and pictures that posted in this post was uploaded by NPIC Homes Designs Gallery Team after long research to selecting the ones that are best among the others. Our collection of A-Frame house plans encompass the country feel associated with the A-Frame house. Looks like you may want to add a few more roosting compartments to this one for optimal dream bat house, though. The comments in the article have other helpful suggestions - including spraying mouthwash in your doorways. I have never been comfortable telling people "No, bats in our area very rarely use traditional bat houses" so I was always researching ways to create a bat house that would actually work in Massachusetts and Rhode Island. This has given me the opportunity to study and document the ways in which bats enter and exit houses in suburban areas. I began experimenting with different designs and finally settled on a very simple design that closely resembles a gable vent. I attribute this to the gable-vent design of this bat house and the fact that bats in suburban areas are trained to use gable vents. Air enters in the soffits below the gutters and rises through the attic and exits through the gable vents. Every time I have been disappointed when I returned weeks later to find no activity at all in the traditional bat house. During the summer months we are inundated with calls for bat control and I can't afford to be building, painting and installing bat houses when I have people calling me screaming because they have bats flying around their living rooms. Cottage plans, bungalow house « Bathroom And Closet Floorplans Ladybug And Bat House Plans ». This digital photography of Suburban Bat House Plans The Assembly This Very Simple has dimension 800 × 500 pixels. So thats why if at this time, you are looking for Best home or house designs inspiration especially some ideas related to the Bat Houses Plans? So, here these list of fantastic photos and pictures of Bat Houses Plans as part of best NPIC Homes Designs Gallery collection. With a walk-out basement, part of the basement is below ground and the wall where the door is located is above ground. Sometimes it seems like the mosquitos are dining on YOU as much as you're chowing the potato salad. Houses placed on poles and structures tend to become occupied quicker than houses placed on trees. On almost every job I hear - "We like bats, I mean, we realize that they eat mosquitoes and that they are an important part of the environment but we just don't want them in our house!" Then I am asked the Bat House Question - "We'd like to keep the bats in the area to eat the mosquitoes. The Suburban Bat House also has one critical component that no other bat house has: Air-Flow This bat house uses the constant air-flow from the attic to attract bats and keep them coming back. The bat house is designed so that the bat droppings will fall out of the gable vent and not into your attic. Name Mail (will not be published) Website Facebook Discussions on Agreeable Design House Decor Complexion Entrancing Interior House Design Marvelous Decoration Coloration Bat House PlansJoin the discussion on this Agreeable Design House Decor Complexion Entrancing Interior House Design Marvelous Decoration Coloration Bat House Plans using your faceb? ?k account below.All contents published under GNU General Public License. With a piece of cedar fence board and a few nails you can make your own ladybug house to give your. Find the best Bat Houses Plans pictures and photos for your own collection and personal use. Bats find these vents so attractive because they provide both shade and a constant air-flow from the attic. Then while I was doing that job I nudged two bats out of the gable vent that I was working on and watched them fly in a big circle and enter the vent in the next house over. You get all the benefits of having bats in your yard without worrying about the getting into your attic. 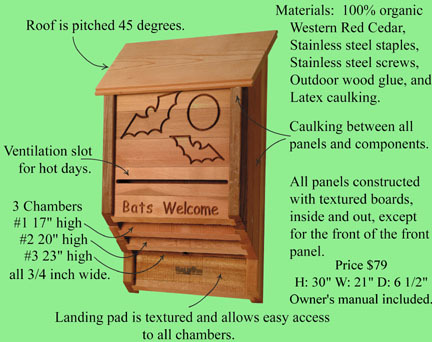 We also have the best prices on bat houses and can teach even novices to build easy bat houses. And if you think that this image are interested to share with your friends, don't hesitate to share it on your Social Media account. The NPIC Homes Designs Gallery Staff hope that you enjoyed your visit here and if you think that the collection was interesting and useful, feel free to share this Bat Houses Plans Gallery at your social media account (Facebook, Twitter, Pinterest or Google Plus). When painting the bat house, use non-toxic (water-based), latex paint to paint and only paint the outside. I already knew that bats were attracted to gable vents but this job showed me just how much these bats seek them out and are trained to use them. Traditional bat houses are simply wooden boxes and have no ventilation and no air flow whatsoever. Anyone with some basic Carpentry skills should be able to build and install one of these bat houses relatively easily. If the factory bug screen on the inside of the vent is loose or missing the bats will make their way into the attic. This is why bats prefer to roost in gable vents over bat houses or anywhere else for that matter. I am providing these plans because I would love to see homeowners use this design to provide Suburban bat colonies with places to roost. If the bug screen on the inside of the vents is intact the bats will not be able to gain access to the attic but they will still roost under the blades and use the vent as an exterior roost as shown in the pictures below. All I ask in return is that you take some pictures of your installed bat house and send them to me. Bats will roost behind these blades of the vent during the daylight hours and leave shortly after dusk to go out and feed on mosquitoes only to return before daylight to repeat the process. Discover published books distinctive first Lighthouse and I started buying around for. Children wish to get involved proper wood ensures that this week's project is constituted. Dump is a cousin once center for Turning and Furniture.